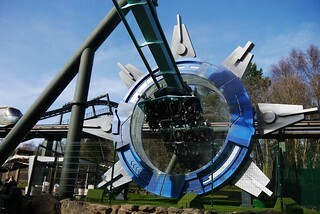 If you're looking for an out-of-this-world adventure, look no further then Alton Towers' flying coaster. Offering its riders the opportunity of flight, Galactica is one of the more serene thrill rides in the park as guests soar over their surroundings. Galactica debuted in 2016, featuring a new iconic portal as well as a new shop, photo point and changes to the station area. Although the track and trains were identical to those of Air, riders now had individual VR headsets designed to warp reality around them as they rode, fooling the senses to transport them into outer space. 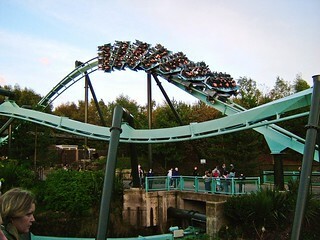 The new technology for Galactica proved troublesome almost from day one, which meant that even in its first season, guests would often experience faulty VR and the ride would sometimes run with no VR at all. By 2018 VR had been removed from all but the back three rows of each craft allowing guests to choose whether or not they experienced the ride in virtual or actual reality. 2018 also saw on ride photographs return to the ride after two seasons where guests would be photographed in a 'space suit' helmet in the queue line for the souvenir photo (since the rider's face would be obscured by the VR headset whilst on the ride). 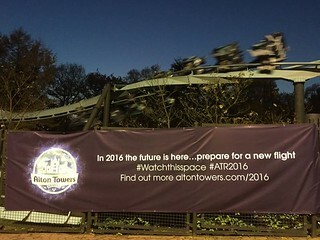 After just three seasons as a 'virtual reality coaster', in March 2019, the park started telling guests on Twitter that VR would no longer be available for the new season. No other changes are expected as a result of the change and the ride is expected to remain known as Galactica, despite no longer taking guests on a quest beyond the solar system. In 1994, Walter Bolliger and John Wardley stood watching their new creation Nemesis wow the crowds on its opening day. Whilst watching Wardley announced that suddenly they had a real problem on their hands - "How to top this?" Walter apparently turned to John and said "simple - we take the riders and turn them prone". This simple idea in 1994 proved to be harder than they ever imagined, and the ride took 8 years to come to fruition. It's a little known fact that originally Air was intended to be Secret Weapon 4, however, the concept was far from ready, so Oblivion was constructed in its place to fill the gap until the flying coaster was ready to be built. For more information on the creation of Air, take a look at our development archive. 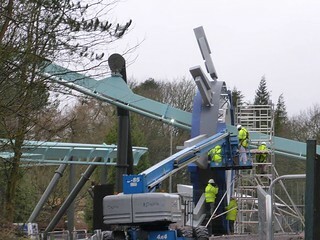 When Air finally did open on the 16th of March 2002, Alton Towers proudly played host to a prototype that would go on to be one of B&M's most advanced roller coaster styles. Offering its riders the opportunity of flight, Air acted as a perfect tonic to the more white knuckle thrill rides in the park; a great ride for intorducing first timers to larger coasters, offering a ride that the whole family could enjoy together. The ride more than held its own as a major attraction within the park for nearly thirteen years, before the folk at Galactica Tours moved in to transform the ride into a new space adventure in 2016. As a nod to the ride's origins the redeveloped trains of Galactica are emblazoned with "Air Space Technologies", as the company that Galactica Tours have 'partnered with' to provide the propulsion technology to blast riders into space.